How do I use my Samsung wireless bluetooth keyboard and built in mouse? The Smart wireless bluetooth keyboard is a comprehensive control solution for all your needs. 1. You are able to navigate and type with no wires and more comfort. This wireless bluetooth keyboard can be used similar to a usual keyboard, but with more and effective functions. 2. Using the built-in touchpad for fast and easy navigation makes the life easy. This touchpad allows you to browse in Smart Hub. 3. 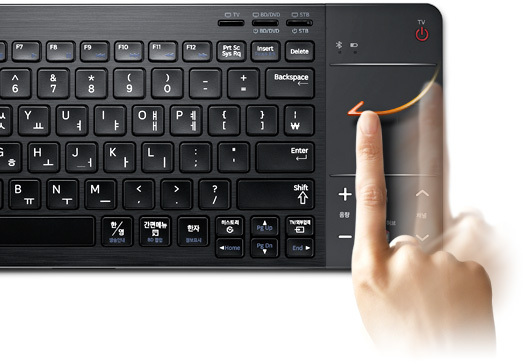 It also has the feature of remote control functions with usefull hotkeys.By pressing the FN (function) button on the Keyboard you are able to switch to remote control function. How do I connect my Samsung wireless bluetooth keyboard to my Samsung television? When Should I Use HDMI Cable?